Back in January, Doug Danner had asked me when my son’s Spring Break was. I told him and he asked if we would be interested in joining him and his son, Jeremy, on a snowmobiling trip to West Yellowstone. Ok, I really didn’t need to think about this one very long. I wasn’t going to give him any time to reconsider his offer in case he thought he was talking to someone else so I quickly said YES! It did mean a lot for me to be able to bring Logan riding in the mountains. It is something I always wanted him to experience. We’ve ridden together on snowmobiles and dirt bikes for all his life. Even in his teenage years where they really don’t want to be seen with Mom and Dad, he still rode with me. As time goes on, Mom and Dad aren’t as cool as they used to be. I remember one time he wouldn’t go to a movie with us. We asked why? Someone might see me! What?? It’s not like we are going to put on our clothes from the eighties and ride three up on a scooter downtown to the movie theater! Anyway, I knew a trip to the mountains would be a riding experience he would never forget, and to do it with great friends like the Danner’s would be a bonus. Logan grew up racing with Jeremy on the Kids Pro Ice Circuit in Minnesota and Wisconsin. That is where I got to know Doug, even though he had all Ski-Doo’s (which I learned to look past). After the kids were grown and done racing, we stayed in touch and now we have spent the last few years with Doug and Jeremy Danner at the Grantsburg World Championship Watercross and we have always had an awesome time. I was in need of some new gear, so my first order of business was to buy some new stuff. By that I mean a new helmet. My dirtbike helmet is a tad tight when worn with a facemask, so I really thought I needed a new one as I would be wearing it quite a bit during the 5 days of riding. And truth be told, helmets and I are pretty much like shoes and women; can’t have too many. Also, because I may or may not be an organizational freak, I had to buy a new gear bag for the trip. In my own defense, this new one will now store all my dirt bike gear AND my boots. After two days of driving and over 1000 miles we got up on Monday morning in West Yellowstone and we knew clouds and snow were in the forecast. 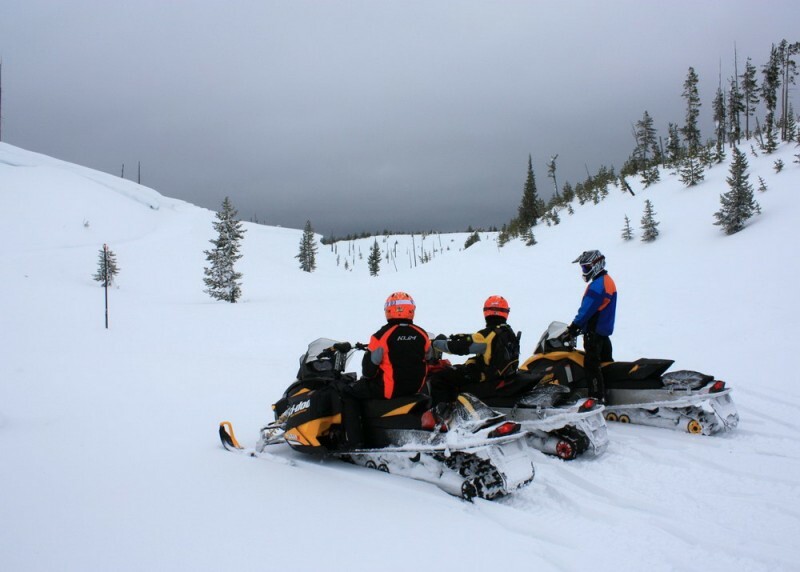 We rode south out of West Yellowstone after picking up my 2014 Polaris RMK Pro 800 rental sled from Polaris West. It was decided not to venture too far off the trails that day as the snow could move in at any time. 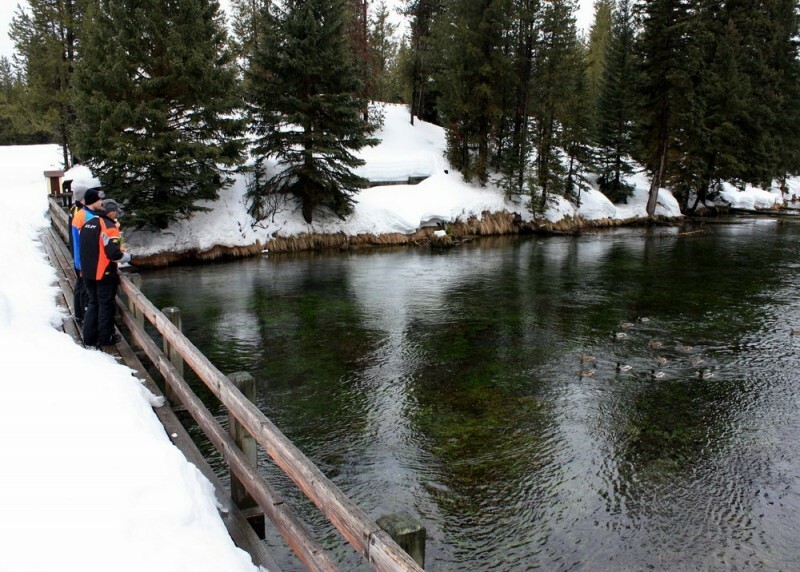 We ended up down at Big Spring and decided to take a break and feed the ducks and trout. They even have pellets next to the bridge that you can feed them with. The ducks came flying in for the free handouts. If the food made it past the trout, it did not get past the ducks. It started raining so we decided to head back. The rain finally changed over to snow. I thought this was a good thing until it started snowing heavily and it began to stick and build up on the goggles. Finally, back at the hotel we started drying our gear out from the rain and snow which promptly made our room smell like a combination of wet dog and a 15 year old boy’s room closed up for a week. Really glad we could open those windows in our room. Tuesday we headed southwest to Two Top as there was fresh powder now. The trail up there was great with the bright blue skies and fresh snow increasing on the trail and the trees as we gained elevation. The snow covered trees at the top were really cool and the view was spectacular. After coming back down a ways from Two Top we played in the meadows. It’s here where the kids got their first chance to try their skill at carving in the deep snow. Some of the trails we found on the way back were pretty rough, but we learned through this experience to check the West Yellowstone Chamber of Commerce website every morning to see what was groomed the night before. 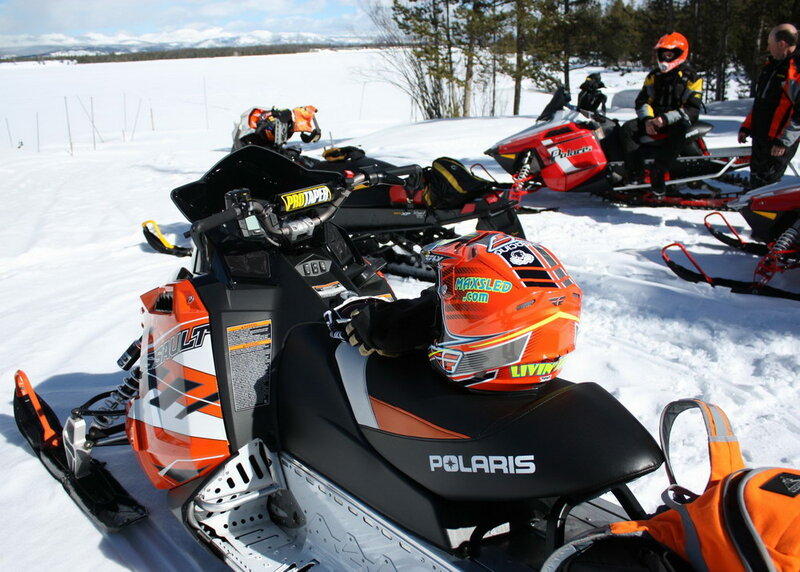 Once back in the town of West Yellowstone we stopped by Polaris West. They had some of the 2015 Polaris demo sleds sitting outside that Polaris had left over from the Snow Shoot. We talked to Brandy and she let us take out 3 of them for a quick spin. Unfortunately, Jeremy was still 17 so he wasn’t able to ride a new Polaris. I’m sure he was a little heart broken, or maybe it was me that was a little heartbroken because we couldn’t go back and tell this story to his Grandpa who owns Danner Sales, a Ski-Doo dealer in Inver Grove Heights, MN. 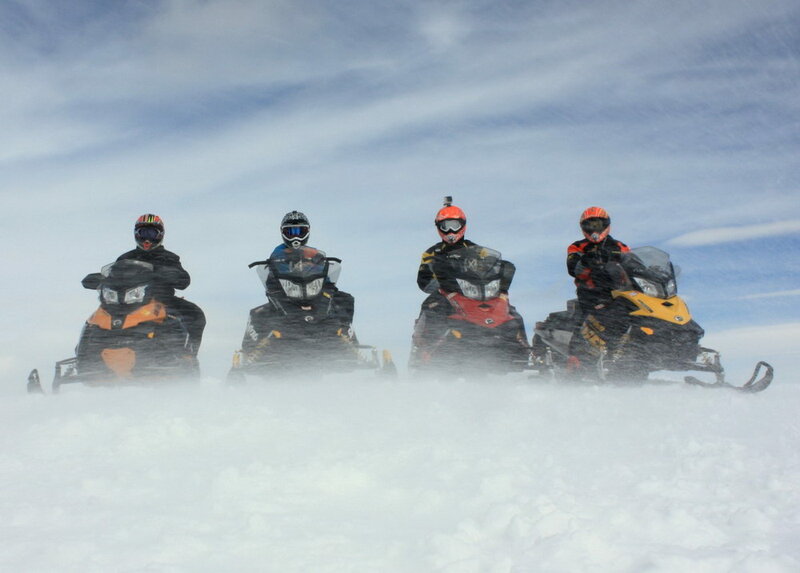 It was cool to be riding next year’s sleds. We took out three new 800’s, one short track and two 144’s for a two hour tour. The new 800’s were pretty impressive. We all topped out at a staggering 45 mph. Yes, 45mph. Because that’s the speed limit on the trails near West Yellowstone. Wednesday was a beautiful blue sky day in the mountains. We headed up Big Sky Trail and back in to the Cabin Creek Cabin. 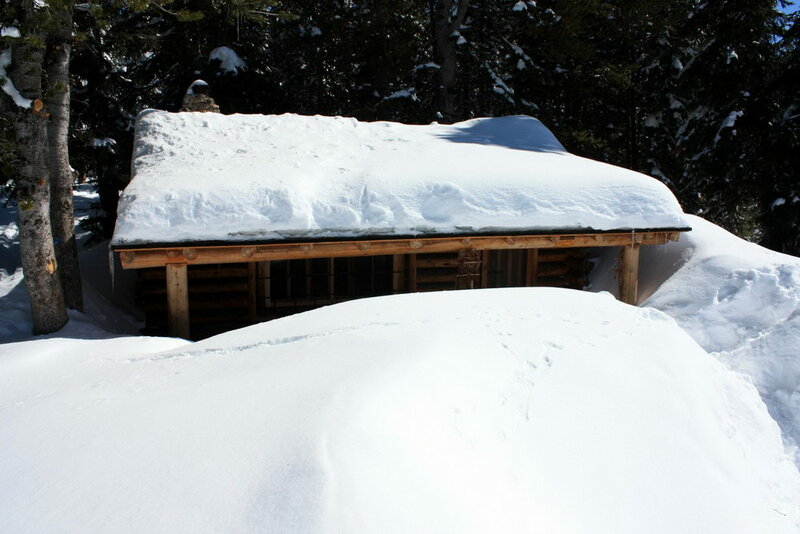 Some people may miss this cabin because of all the snow. It was hard to tell a cabin was even there. We were taking a break and admiring the cabin when I noticed Doug was gone. Soon he returned with firewood and started a fire. Once that was going he brought out hot dogs, buns (some a little flatter than others), ketchup, mustard and chips. He was our well prepared guide. The scenery was unbelievable. Snowcapped mountains everywhere you looked. We were just getting done with lunch when a guy pulled up and asked if we had seen the avalanche that had just happened. We hadn’t but we could see the aftermath. It was not a small avalanche and on its way down it had covered up a lot of snowmobile tracks on the hill. We were thankful that there was nobody in the wrong place at the wrong time. Later, when playing in the open meadows west of the cabin we could see where two more avalanches had happened on the mountains. Every morning I listened to the Avalanche report on the radio and it was getting to be a high danger in that area. There was an 18 year old from a town near where I live in Minnesota that unfortunately passed away in an avalanche that same day near Cooke City. That same day there was another group from Minnesota just to our west by Mt. Jefferson that a rider triggered an avalanche. We saw this in a Facebook post and later video of it actually happening. 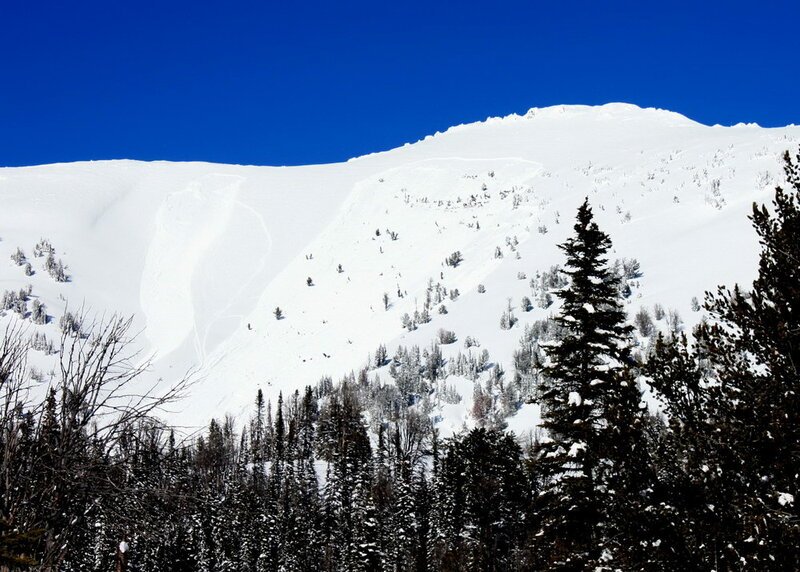 This video also ended up on YouTube and on the Gallatin National Forest Avalanche Center website. 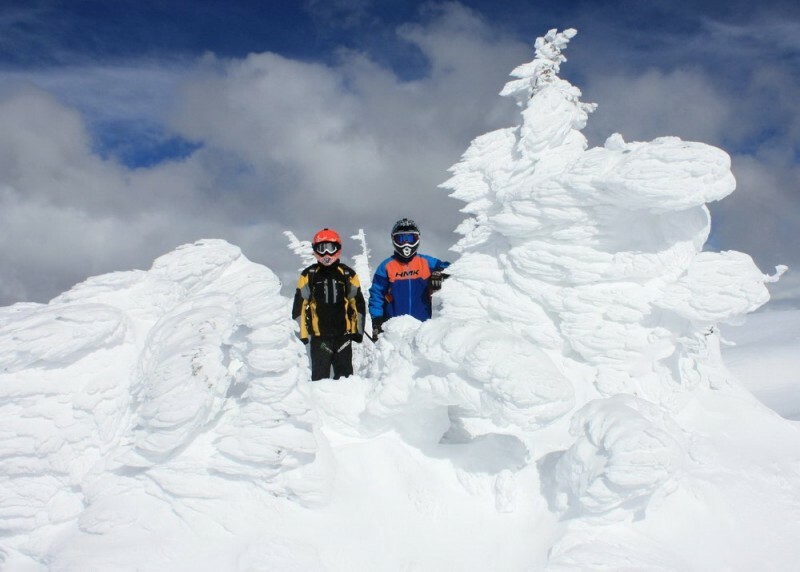 Our families and friends raised the issue of avalanches many times before and during our trip. Doug and I were very aware of the dangers and we would never put ourselves or especially our kids’ lives in jeopardy riding in these areas. 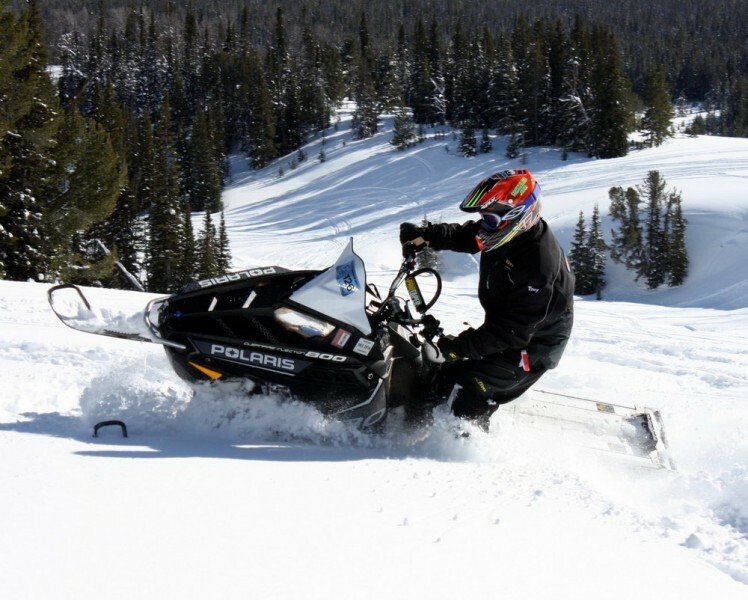 The fact is, we are flatlanders and we realize that part way up a steep mountain side is not where you want to run out of talent with a rented or borrowed sled. Watching mountain videos some people think “I could climb that” or “I could jump off that cornice”, but when you are there, you realize just how steep things are and how big things are and those thoughts can quickly diminish. So we were very content playing in the mountain meadows and riding in and out of the trees. I think this area back by the cabin was probably the favorite of the trip. We found some deep snow where you could carve circle after circle or explore one meadow after another. Doug and I stopped and talked often and just watched the kids play around in the meadows. 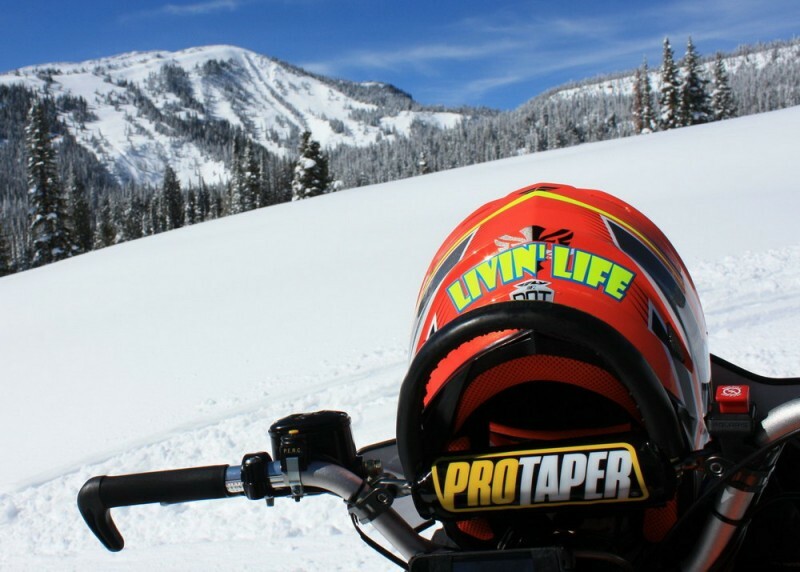 For us, sometimes this was just as satisfying watching them enjoying the sleds, the riding, and the mountains as us doing the riding ourselves. At least that is what I’m saying because I just don’t have the energy anymore at 9000 feet that a 17 or 18 year old does. On our way back the sun was setting as we pulled in to the Hi Country Tavern and Grill to grill our own steaks for supper. Thursday we headed back north up the Big Sky Trail. But at the end of the groomed trail instead of heading west to the cabin, we went north. It ends up to be a narrow single track trail through the trees. Sometimes the snow was taller than the sled on each side. Once out of the trees, the mountains seemed close but watching some riders hill climbing near the base of them I realized it was still quite a distance away. This made the cornices at the top of these mountains even that much more impressive. This evening we had to bring the 800 RMK back to Polaris West. That sled was a blast off the trail and handled remarkably in the deep snow. Thanks again to everyone at Polaris West. Friday we pulled a fourth Ski-Doo out of the trailer so I had something to ride the last day. It was a 2013 MXZ 600 with the rMotion rear skid. Very nice riding sled. It was a short track but we had decided it would be more trail riding the last day anyway. We went back up to Two Top but there was a front moving in so it was really windy up there. I tried to set my camera on my back pack on the ground and then set the timer and race back to the sled for a picture of the four of us. I tried this 3 times. The first shot was a little sideways, the second shot Doug was not smiling, and the third shot finally turned out. When riding back that day on the trail I just remember that I didn’t want to stop riding, I just wanted to keep going. We had created so many good memories. Some I wrote about here. Others were purposely left out to protect the innocent (me). I couldn’t have asked for better people to go with than the Danner’s. There really wasn’t a time where we weren’t having fun or things really went wrong. The only fighting we had was at times we might have gotten into a little altercation on both of us trying to pay a fuel bill or a dinner bill. I usually won as I’m a little bigger than Doug, but after seeing my credit card balance after the trip, maybe I should have let him win a few more times? Naw, after all was said and done we both spent about the same. Life should be about creating and enjoying moments and memories. Some people see Livin’ Life as riding in the mountains or on a tight twisty trail in the north woods. Others see it as spending time with family and friends. I was fortunate to have all of these on this trip which made it a perfect world for me to be alive and Livin’ Life!